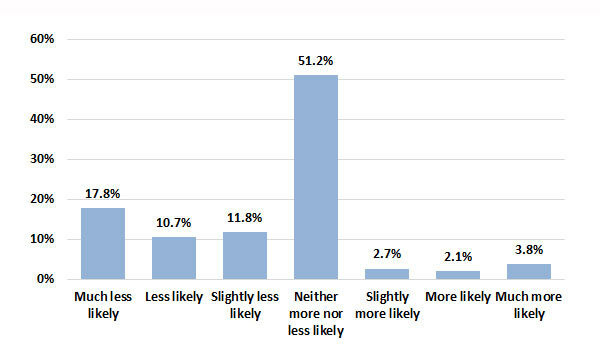 Complete results from our January The State of the American Traveler survey will be released in February. As an early sneak peak, this post looks at domestic traveler sentiment and what may be early signs of a softening leisure market. The new year has started with undertones of considerable uncertainty. While economic indicators had remained strong for much of the past year, talk of a slowdown now is in the wind. 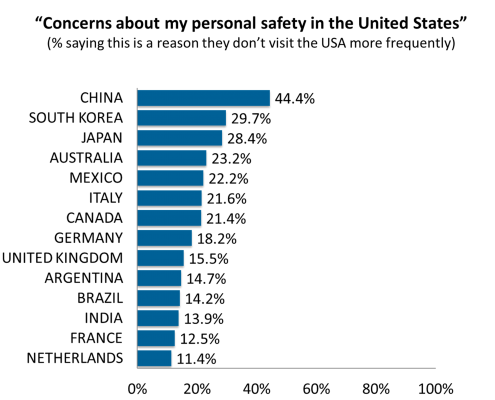 Sluggish growth, trade wars, higher interest rates, inverted yield curves, political gridlock and government shutdowns are all part of the conversation. We are currently experiencing what may be early signs of a pessimistic shift in the collective traveler psyche, as our latest sentiment tracking survey point toward a potential weakening of the domestic leisure travel market. Every quarter, Destination Analysts ask a representative sample of 2,000 American leisure travelers about their travel plans for the upcoming year. In the most recent survey wave, the percent of travelers who said they expect to travel more in the next 12 months decreased. Only 33.4 percent said they would be taking more trips, compared to 37.0 percent one year earlier. As this data typically has a seasonal pattern, comparing past January waves is likely to be the best point of reference. The chart below shows how travel expectations have dipped significantly below performance levels seen in the past two years. 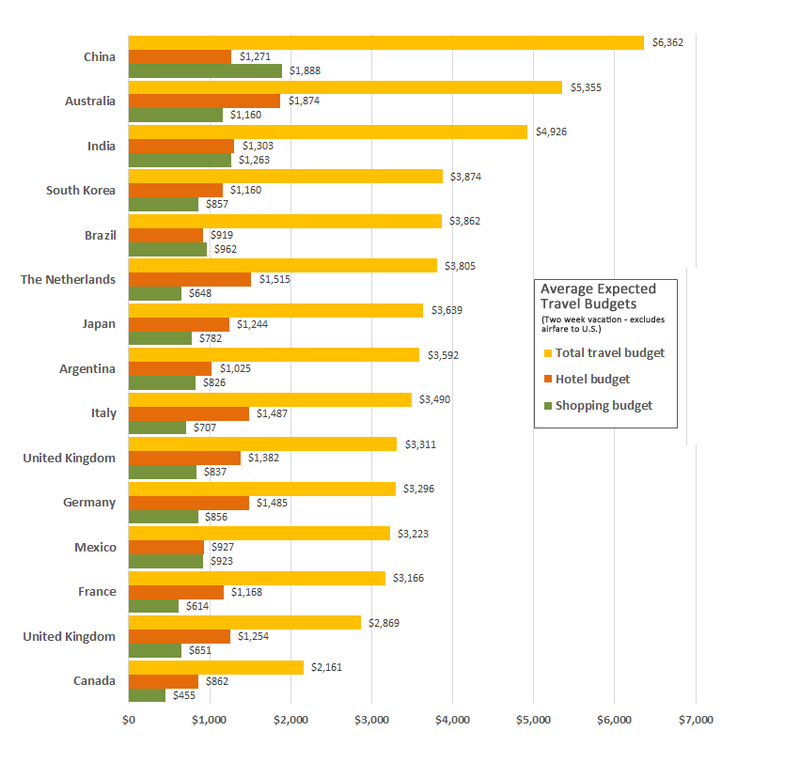 This moderate degree of pessimism seen in trip expectations also extends to future travel spending. 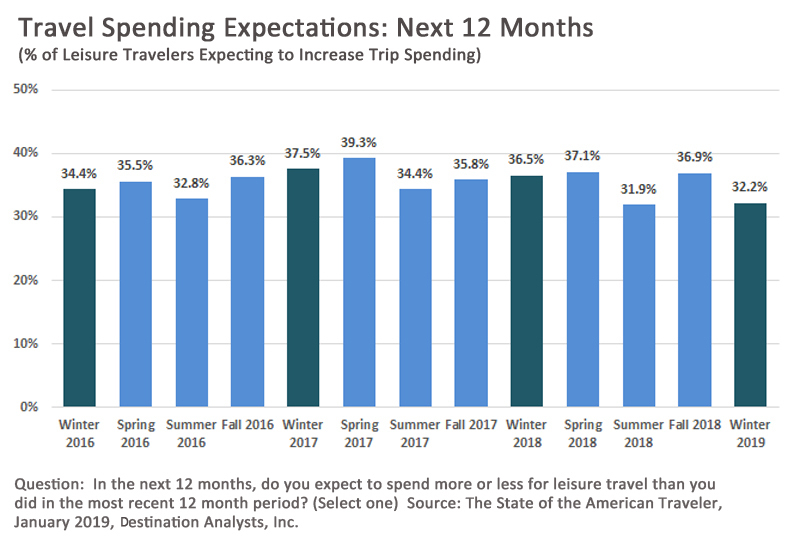 When asked if they expect to spend more in the upcoming year on leisure travel, only 32.2 percent of American leisure travelers said that they would be beefing up their expenditures. This is down from 36.5 percent one year ago. 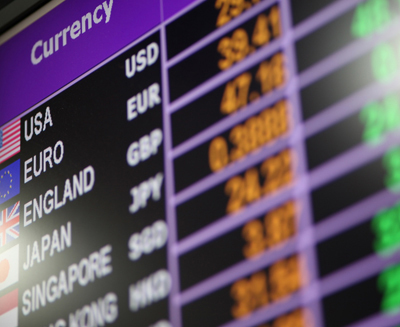 Travel volume and spending expectations have indeed softened, but potentially more unsettling is a drop in the general sentiment of how important leisure travel is as a budgetary item. 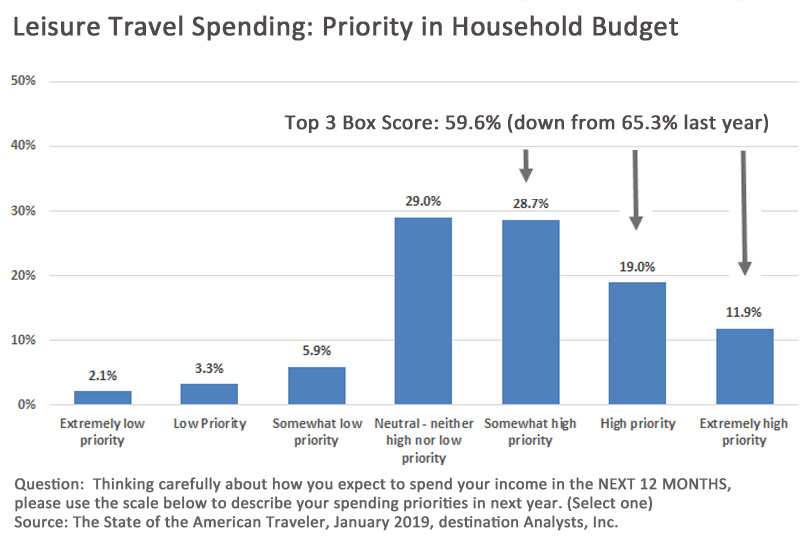 Once a year, we ask how much priority travelers intend to place on leisure travel as they allocate their family budgets. At this time last year, nearly two-thirds of American leisure travelers (65.3%) said that leisure travel would be at least a “somewhat high priority.” This year, the corresponding figure has sharply dropped to 59.6 percent. The chart below shows the results from this year. So, what’s the bottom line? It may be too early to tell. As we move further into 2019, we expect that the domestic leisure market will likely remain robust, however a significant downside potential exists. With uncertainty on so many fronts, we’ll hold our breath and hope for a positive outcome. Earlier this year, our blog examined a variety of natural disasters through which our clients had unfortunately been suffering. (Read more here) Of course, we hoped that was the end of it. Our friends in the industry would see no more trouble; or as the great Willie Nelson said, “nothing but blues skies from now on.” Alas, those dreams were shattered this summer when a severe and unusually persistent Red Tide ravaged the south Florida tourism industry. If you’re not familiar with what a Red Tide is, it’s a real mess. Red Tide is a dangerous accumulation of naturally-occurring microscopic alga that has been documented along Florida’s Gulf Coast since the 1840’s and occurs nearly every year. It can harm sea life as well as cause respiratory inflammation and unpleasant burning skin reactions in humans. A combination that is not good for tourism. This year, an unusually persistent Red Tide — the longest in the area since 2006 — happened along the Florida Gulf Coast. In coastal tourism communities, the impact to the local tourism economy was severe. If there is any good news in the situation, it’s that only half (49.1%) of American leisure travelers had actually heard of the Red Tide situation prior to taking our most recent The State of the American Traveler survey. (This may be one of the few cases where a destination marketer wants its customers to be in the dark, unfamiliar with its product.) Still, amongst American leisure travelers, the event has had a significant impact on desires to visit. When asked how the Red Tide would impact their travels in the next 12 months, 40.3 percent said it would make them less likely to visit the Florida Gulf Coast. While a certain percentage seem interested in experiencing this unusual event, they are outnumbered 5 to 1 by those who say they are less likely to visit. The impression left by this disaster with travelers isn’t good. 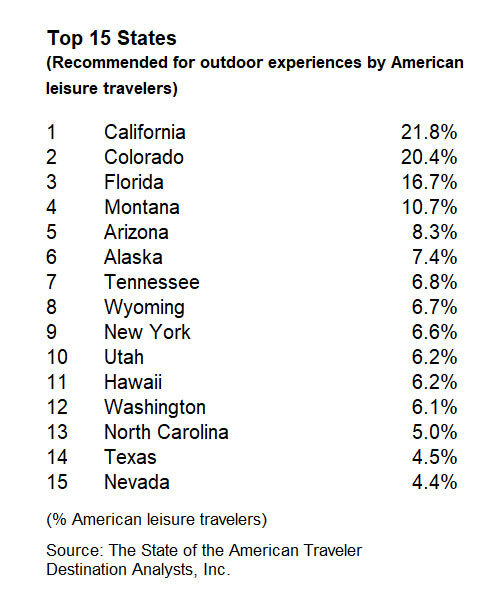 While it is unclear how this will actually impact travel behavior, let’s hope that people have short memories and that the upcoming year will be a banner one for Florida tourism. As a matter of fact, as we move into the New Year, let’s hope for a 2019 free of the disasters that have recently destroyed the great work being done by our destination marketing community. While A.I. bots are far from ubiquitous, their growing presence in American homes is undeniable. 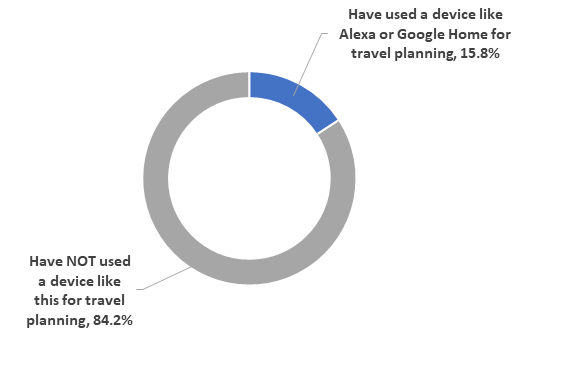 According a recent Destination Analysts’ The State of the American Traveler Survey, over 15 percent of travelers report having used such an artificial intelligent assistant device to plan their trips in the past year, up from 13.3% one year ago. Younger travelers are clearly the most active users of these high-tech assistants. Q: In the PAST 12 MONTHS, have you used a device like Amazon Echo or Google Home for travel planning? As our reliance on this technology’s ability to quickly disseminate information and answer burning questions such as, “How tall is Shaq?” increases—it begs the question, what role will these devices play in the travel space? As our industry ponders this greater question, Destination Analysts set out to answer a simpler question: Is Alexa or Google Home the better travel planning assistant? The applications of this new digital medium are continually evolving. As we look to the future it will be interesting to see how marketers take advantage of this platform to get their message in front of these tech conscious consumers. 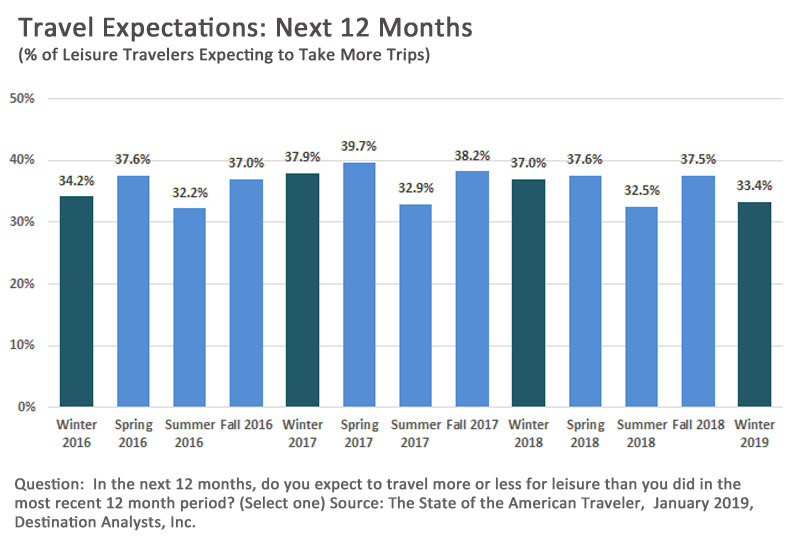 Destination Analysts will be tracking these trends and sharing our findings in later editions of The State of the American Traveler so stay tuned! Now trending on Instagram, YouTube, Pinterest and beyond, digital influencers are moving the needle for destinations of all types. Our latest research sheds some light on the extent of their impact. Influencer marketing has quickly grown into a big business over the past few years, and savvy destinations around the world are already working to incorporate it into their marketing mix. However, there seems to be a general lack of understanding about this relatively new approach to destination promotion. Whether the goal is to create “buzz” around a destination’s brand, to establish credibility in the marketplace, or simply to generate direct bookings, many of our clients have admitted that they feel like they’re flying in the dark. With this in mind, we added a few relevant questions to this month’s The State of the American Traveler survey to take a basic measure of the market. Specifically, we sought to learn how many leisure travelers are using content created by these so-called digital influencers, which traveler segments are being influenced, and, perhaps most critically, what they’re using this content for. DEFINITION: A “DIGITAL INFLUENCER” is a person who has established credibility online and who shares their opinions and experiences with a large audience. This can include bloggers, travel writers, YouTube personalities and/or persons with large followings on social media (Twitter, Instagram, Facebook, Pinterest, etc.). For those interested in entering the game of influencer marketing, the survey results look promising. Nearly one in five American leisure travelers (18.3%) reported that they have indeed used the opinions of a digital influencer in their travel planning sometime in the past year. 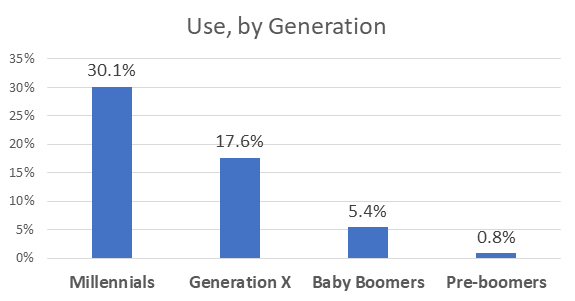 Furthermore, the generational differences among respondents is striking. 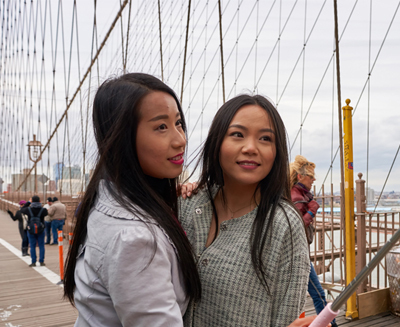 Over one-third (36.8%) of Millennial travelers say they have used content from a digital influencer to help plan a leisure trip in the past year. 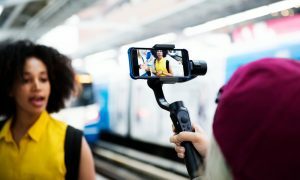 For now, it seems that the older generations are somewhat less susceptible to being ‘influenced’ in this way – only about one in five Gen Xers (19.9%), and fewer than one in ten Baby Boomers (8.0%) reported using the opinions of a digital influencer to help plan their travel in the past year. And what types of decisions are they influencing? 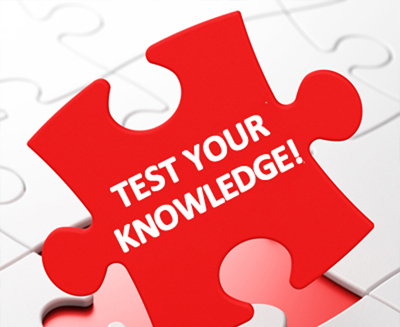 The answer will be music to the DMO marketer’s ears. (Drumroll please.) When asked what travel planning tasks they had used digital influencer-generated content for, survey respondents most commonly said it was to help select the destinations they would visit. More than half of those influenced in any way (55.1%) said that in the past year, they had made at least one destination decision based on digital influencer content. The typical respondent also indicated that several of their other travel-related decisions were impacted, too – on average, a total of 3.6 decisions (see chart below). The decisions affected range from the restaurants they choose to dine at in a destination, to which hotels to stay at, where to shop, and to how to get around using local transportation. Finally, those who indicated that they had selected a destination to visit based on content from a digital influencer were asked to categorize the type of place it was that they visited. 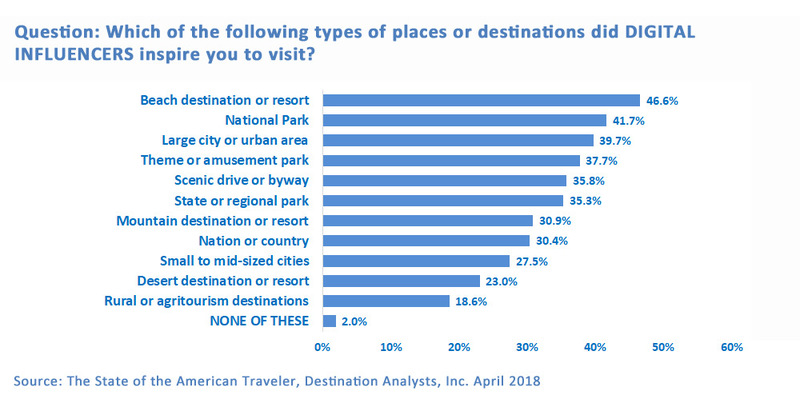 Beach destinations, national parks and big cities were the most common answers, but as the chart below shows, destinations of all types are receiving traffic driven by digital influencers. Simply put, digital influencers are important. They’ve already carved out a significant niche in the battle for consumer attention, and their impact will likely continue to grow. Natural and man-made disasters have been known to wreak havoc on a destination’s reputation and visitor volume. But how much do disasters truly affect the interest of travelers in visiting a destination, and how long do these effects linger? We asked American leisure travelers for an answer, and found that people may not hold onto these negative associations for as long as we had thought. They say that life comes at you fast, and in the last several months, several of our friends in the industry have experienced this firsthand. Unexpected natural or human-caused disasters have touched their destinations, consequently impacting their brands and their ability to attract visitors. From wine-country wildfires to political riots on the East coast, a series of disasters have struck the destinations represented by several of our clients. Beyond the immediate difficulties, concerns and questions about their longer-term effects are being raised. 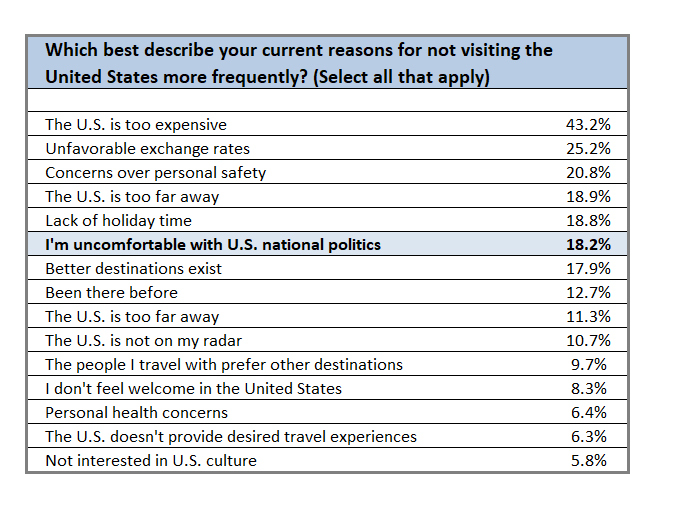 To help shed some light on the issue, we added a few pertinent questions to our most recent The State of the American Traveler surveys. 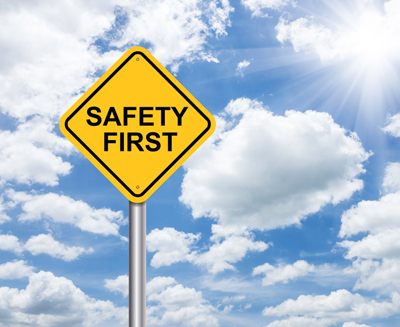 This blog post shares some topline findings, and suggests that travelers may not hold onto these issues as long as we think. The first piece of good news is that awareness of these disasters is far from universal. In fact, when we began looking into this last October, only about one third of American leisure travelers said they were even aware that the California coast at Big Sur had been closed to visitors due to crippling winter landslides. Fewer than half of travelers (48.8%) knew that the State of Oregon had been hamstrung by crippling wildfires. Even in these crazy times, politics may not be on the mind of as many of us as one might think. Only two-thirds of American leisure travelers were aware that the City of Charlottesville, Virginia had been the scene of dramatic political unrest late last summer. Amazingly, one in ten of us was not aware of the Las Vegas mass shooting in October. 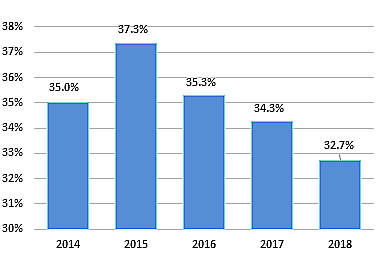 The chart below shows recall rates for each of several disasters happening last year, and fortunately, it appears our memories for these things are not long. 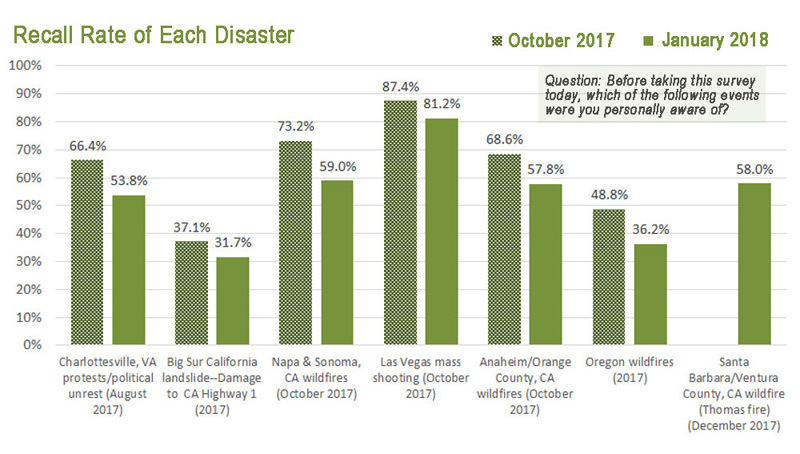 For each of the disasters studied, in just three short months, the percent of travelers who report having heard about the event dropped significantly. There’s even more good news in the data. While the initial impact of a disaster on traveler sentiment may be significant, these negative feeling also appear to fade quickly. 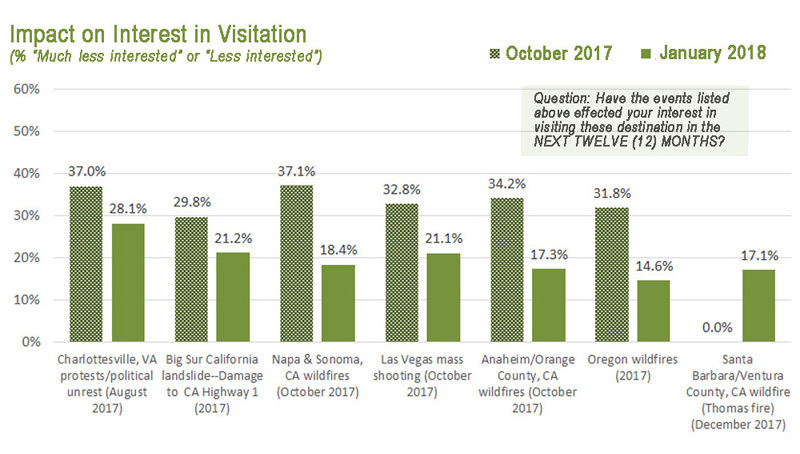 For example, in October when the fires had just ended, 37.1 percent of travelers said the Napa/Sonoma fires made them less interested in visiting the destination in the next twelve months, but by January this figure had fallen to only 18.4 percent. Similar results were seen for the other disasters. So it appears that uncomfortable feelings about a place generated by calamities evaporate fairly quickly. Damage to the tourism sector caused by these events doesn’t need to be long-lasting. Travelers’ memories are short, and people intuitively understand that time heals wounds caused to a place. Life does indeed come at us fast, but disaster-related problem for destinations can also quickly fade in the rearview mirror. Data source: Destination Analysts, Inc. The State of the American Traveler, October 2017 and January, 2018. Note: The Thomas Fire was added to the survey in January. No data is available for October, 2017.